A NIGHTMARE ON ELM STREET (2010 Version): Are You Ready For Retread Freddy? – Schlockmania! Remakes are a dicey topic amongst horror fans, with some rejecting them out of hand and others insisting that they are a vital way to keep the genre alive. Your Humble Reviewer does his best to keep an open mind on the topic. There’s nothing inherently wrong with the idea of remaking a horror classic, as long as it is done with a proper combination of imagination, ambition and insight. Unfortunately, the aforementioned three qualities are in short supply in the recent remake of A Nightmare On Elm Street. Instead of testing out new characters or a fresh storyline, this tired piece of work rehashes virtually every story beat of the first film. 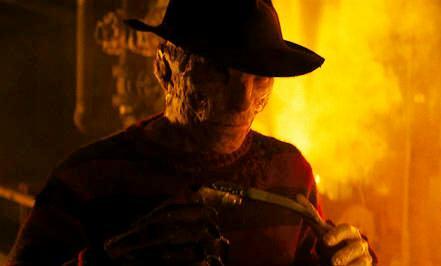 There’s a group of teens being menaced by a dream killer named Freddy Krueger (the slumming Jackie Earle Haley), the main heroine is revealed to be Nancy (Rooney Mara) after the apparent initial heroine Kris (Katie Cassidy) is quickly dispatched, the clueless and deceptive parents won’t listen to their kids, Freddy is taking revenge for his years-old murder from the grave and Nancy must conquer Freddy by pulling him into the dream world to kill him once more. Even key setpieces and images are rehashed here, always to lesser effect: the bedroom-dream murder is done with wires instead of a revolving room, Freddy’s face pops out of a wall over Nancy via crap-quality CGI and the original’s haunting image of a ghost in a body bag is refashioned into a lame, wasteful jump-scare. The script attempts to pull us into dark thematic territory yet only achieves a superficial level of resonance because it never bothers to give us characters developed enough to care about. Reportedly, the shooting draft for this remake was stitched together from 4 drafts culled from a larger pool of 15. The end result has a hacky, checking-items-off-a-list quality to it, right down a fake-out final scare that does nothing to improve the original film’s flawed coda. It’s pure “screenwriting by committee” and feels like it was devised by a marketing team instead of actual filmmakers. In fairness to the writers, this redux does introduce a few new ideas into the mix: there is an attempt to apply realistic effects of sleep deprivation to the teens’ attempts to avoid sleep and the idea of “micronaps” to provide a context for waking hallucinations are intriguing. However, neither really gets explored in detail once they are introduced. Most importantly, the 2010 version of A Nightmare On Elm Street completely misuses its central icon, Freddy Krueger. He is written in an annoyingly inconsistent manner, sometimes acting dour and other times cracking jokes like sequel-era Freddy. The burn makeup used is more realistic, which unfortunately smooths out his features and makes him less expressive. Haley tries to hard infuse the character with the creepy gravitas (creepitas?) that such an icon needs but the dimwitted, unambitious script offers no room for shading or nuance. Worst of all, his mystique is nullified by the filmmakers’ choice to have him pop up what feels like every five minutes. He was used sparingly in the original film until its finale. Here, Krueger is constantly trotted out like a cheap party favor. However, the biggest problem with the modernized version of A Nightmare On Elm Street is that it is completely devoid of anything resembling fun. Like a lot of modern horror films, it confuses being gross or unpleasant with being scary. The teen protagonists are a bunch of glum, indistinguishable sourpusses. There’s no exhilaration, no catharsis and none of the mischievous glee one can feel from a film when it crafts a good scare (all the scares here are of the empty jump-scare variety). As a result, the film quickly becomes a noisy, numbing drudge. The final nail in the coffin is the direction by rock video vet Samuel Bayer, who shows zero flair for atmospherics or kinetic thrills. All he has to offer is generic gloom, which is unfortunately a perfect fit for this misbegotten cash-grab of a remake.